A few questions regarding loading and running BASIC. I get the / char returned and try running E000R and get the output shown in this pic. Can anyone give me a hint what might be happening? I never get the > prompt on this machine. (Previously I was able to load and run BASIC on another Apple 1 and it worked as expected.) I was guessing a memory issue, but swapped out the RAM for (what I think is) good RAM and get the same result. I am able to load and run the Life.aiff program on that page with no difficulty. I also tried the Houston BASIC file with similar results...doesn't work. What is the significance of the EFFE.EFFF = 0C E0? What is the significance of 0300.035FR? Should I be entering the entire E000.EFFFR 0300.035FR into the cassette loader? I want to be sure I'm not missing a step and am follow the load and run instructions properly. 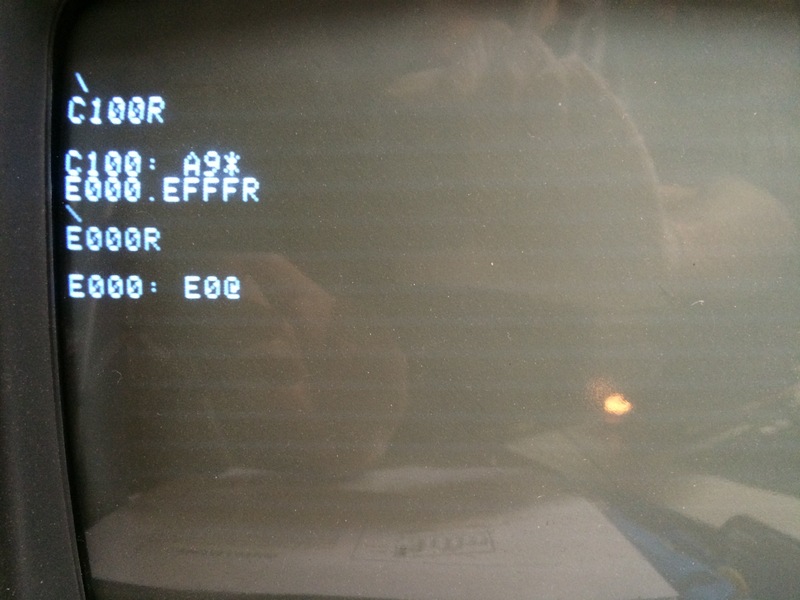 On the Apple 1, you should always check that you have a good load after reading a file from cassette tape - last two bytes (EFFE and EFFF) should be 0C E0 after the read of BASIC completes. Type EFFE.EFFF after the load to see the last two values that were loaded into memory. Since the cassette data is a serial stream, if a bit is picked or dropped somewhere along the way, there is a good chance the last two bytes will not be correct.j The Huston BASIC includes an extra checksum algorithm at 300.35F that checksums the entire BASIC load. I have found checking the last two bytes is sufficient in practice and don't utilize this extra check. Chances are one of these two checks will reveal where the problem lies. Mike is right you need to check the memory. You could also be getting a bad read on the basic audio file. What are you loading it with and what is the volume setting. Also you could have a memory addressing problem. Are you sure your memory is jumpered correctly for basic? Make sure you don't have any metal lint or solder whiskers on the back of the board. That can cause problems. Also are you using 74ls257 or 74s257 and which brand/package. I have seen some problems here with ACI reliability. You must use the "S" and not "LS" and some S don't seem to make the ACI work consistently. Also what cap did you use on the ACI, the .01 or .1 some ICs are sensitive and the .1 can make a difference but in some cases not. Worst case I can make/mail you an actual Basic cassette by saving a copy of loaded basic if you want to try that. Thanks Mike. I'll check the last two bytes next time I load. I saw a post for a memory test routine for the Apple I and II so I can give that a try. The E0 response you get when you try to run is what you would see if there is no memory at $E000. Make sure you have the jumper to E.
I'm loading with an IPhone at about 75% volume (I've also tried higher volume but have had the most luck getting the / at about 75%). I'm using one of Mike's repro ACI cards. I've used this same setup (same iPhone and ACI) on a different Apple 1 and it worked. I'll check the 74x257s. Not sure what brand and if they are l or ls, but I did try swapping them out and same results. The big question for me is how I should have the memory jumpered for BASIC? I have it jumpered currently according to the A1 schematic note. How should it be configured? W should be wire jumpered to E and not be bridged to 1. That was the problem. It's working now. Thanks guys.